The targets are scored 10, 9, 8, 7 etc. No state or national affiliations are required. A limited number of entries (approx. 114 spots) will be accepted. Keep checking the website page for up to date spots available for the competition. 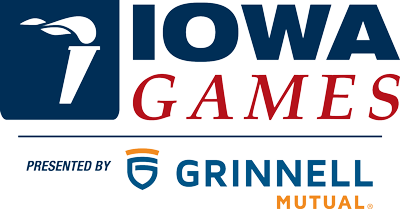 The Iowa Games and Iowa Senior Games have partnered to offer athletes age 50 & over a unique opportunity. When you register for the Summer Iowa Games archery competition, you will automatically be included in the Iowa Senior Games! Athletes will receive an Iowa Senior Games t-shirt and an Iowa Senior Games medal (top 3 places per age division only). If you wish to participate in additional Iowa Senior Games sports, contact the Iowa Senior Games for how to register. Gold, Silver, and Bronze medals will be awarded for first, second and third in each division. When you register please indicate age division and event. ****Pro division competitors will need to have their Professional Cards.